Gilt architectural detailing on the exterior of the palace. Click on any image to enlarge; all photos copyright Carrol Krause. The palace of Versailles was once the most lavish large home in the world, the residence of the French royal family along with hundreds of their courtiers and servants. Containing half-a-million square feet, the palace compound has 700 rooms and 67 staircases. With lofty ceilings, gilded crown moldings, decorative floors, and 6000 paintings, there were also extensive servants’ quarters, kitchens, stables, and service areas. The ceilings of the grand salons are covered with allegorical paintings. Versailles was the creation of Louis XIV of France, who obsessively enlarged and enhanced his residence for more than 30 years during the 1600s. Today it’s toured by three million visitors annually, all hoping for a glimpse of the royal lifestyle. This was the royal family’s private chapel for religious services. The Baroque aesthetic was to leave no surface unadorned. Every royal chamber has gilded paneling and crown molding; every wall has brocaded or flocked wall coverings; every ceiling is covered with allegorical paintings of Greek gods; every floor is patterned parquet or colored tiles. The hallways were done up with contrasting colors of veined marble. Everything inside, from furniture to finishes, is a visual froth of embellishments. 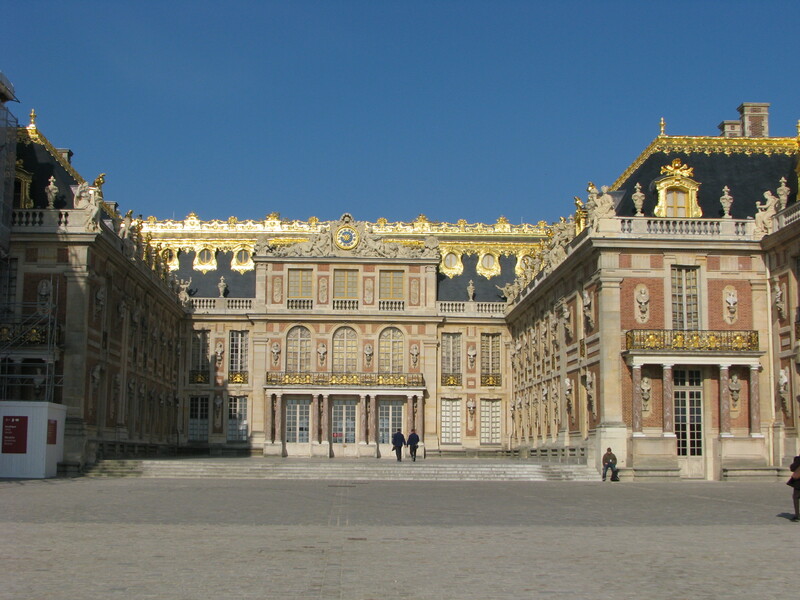 Versailles in its day was so visually overpowering that it inspired copycat palaces all across Europe. The chateau began as a hunting lodge built by Louis XIV’s father, fifteen miles southwest of Paris. Louis grew up during a tumultuous French civil war called the Fronde, during which he was surrounded by conspirators, had no pocket money and slept on ragged sheets. His mother even had to pawn the crown jewels. After consolidating his power as king, Louis compensated for childhood privations by building himself the most luxurious palace imaginable. He continued enlarging it throughout much of his life. There was no privacy for the royal family even in bed. The public could watch the royals from behind the golden railing visible at the bottom of the photo. The original hunting lodge was embedded within a vast series of newer buildings. Floors were added on top of existing structures, courtyards were filled in by new living spaces, wings were built, stables were constructed, staircases were built and then moved, service hallways added and then altered. The place became a complex maze containing sparkling state apartments as well as uncomfortable attic garrets tucked beneath the roof. Ongoing construction at the palace provided job security to hundreds of masons, carpenters, plasterers, gilders, painters and landscapers. An immense support staff was maintained, consisting of cooks, valets, gardeners, grooms, hairdressers, and tailors. Vegetables and fruits to feed the masses were provided by a large potager, or kitchen garden. Look closely and you’ll see the hidden door. The little knob is near the corner of the wall. But life in a palace wasn’t necessarily peaceful or enjoyable. The place was a vast hive of activity. 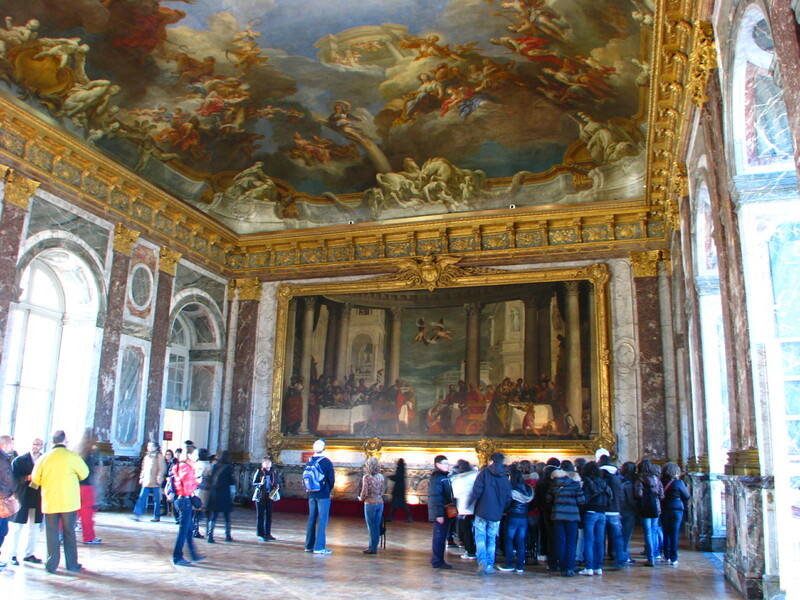 Hundreds of courtiers lived alongside the royal family at Versailles, with their families as well. Nobles who could afford it often moved out of the crowded palace and constructed their own houses beyond the golden gates in the town of Versailles. 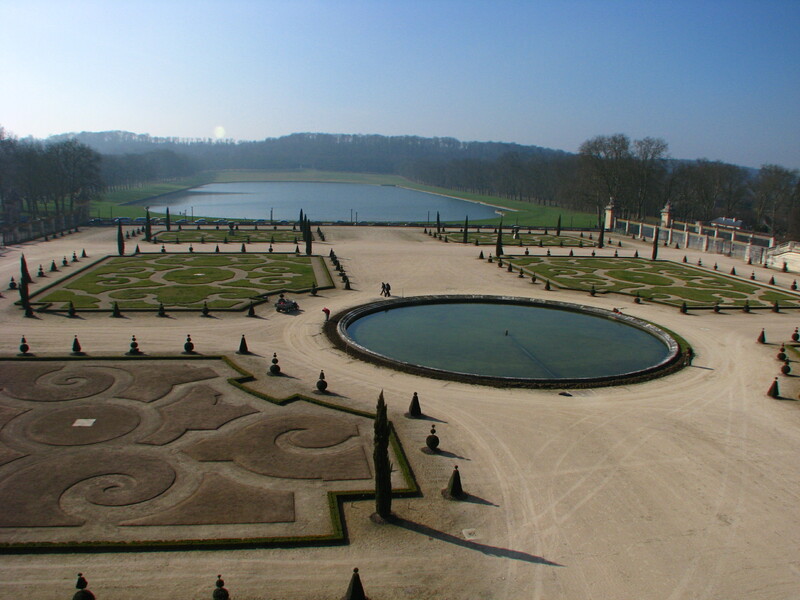 Versailles became a tourist destination almost from the beginning. The first visitor’s guide was published in the late 1600s. Anyone was granted entry to the grounds and the palace as long as the dress code was observed. (Hats and swords for men could be rented from the concierge at the gate.) Entry included the ability to enter into the royal apartments. A gilded railing separated the royal half of each room from the spectators’ portion. Behind these gilded railings, a series of private doors were built into the back paneling of the royal apartments, leading to secret hallways and stairs which allowed royalty to move from one room to another while remaining hidden from public view. 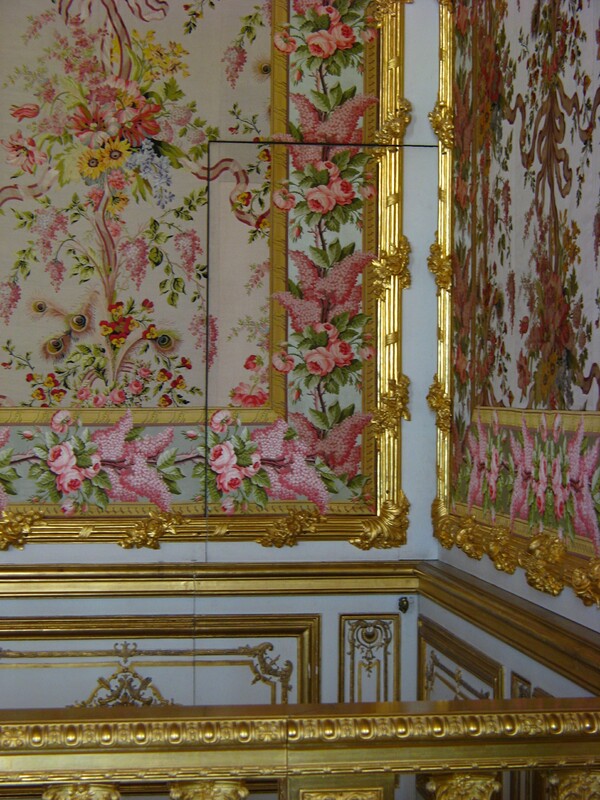 Years later, in 1789, Queen Marie-Antoinette temporarily escaped the revolutionary mob by slipping through one of these doors to the king’s chamber. Marie-Antoinette (married to Louis XIV’s great-great-grandson, Louis XVI) chafed at being on display even when in her bedroom. 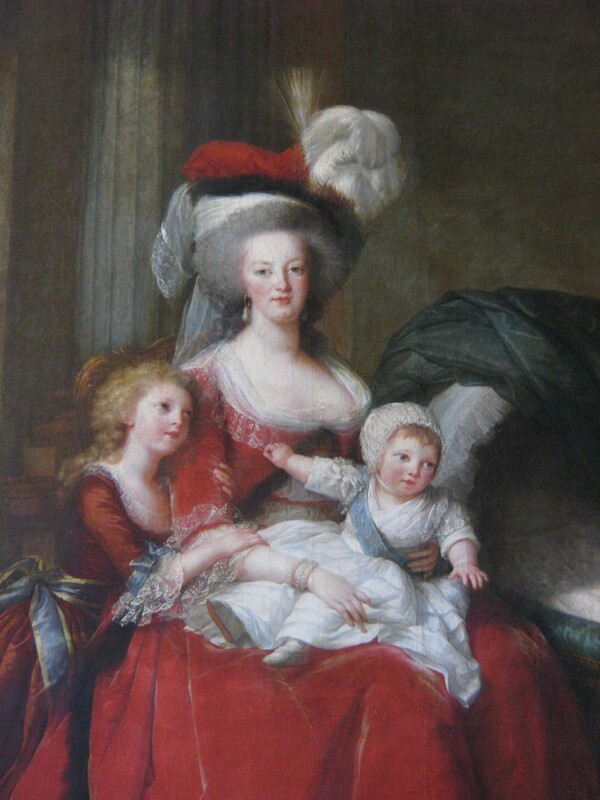 When she gave birth to her first child at Versailles, the entire royal family and all the major state officials came to witness the event. Hordes of other inquisitive people crowded in as well, in such numbers that spectators were crushed against the furniture and walls and movement was impossible. 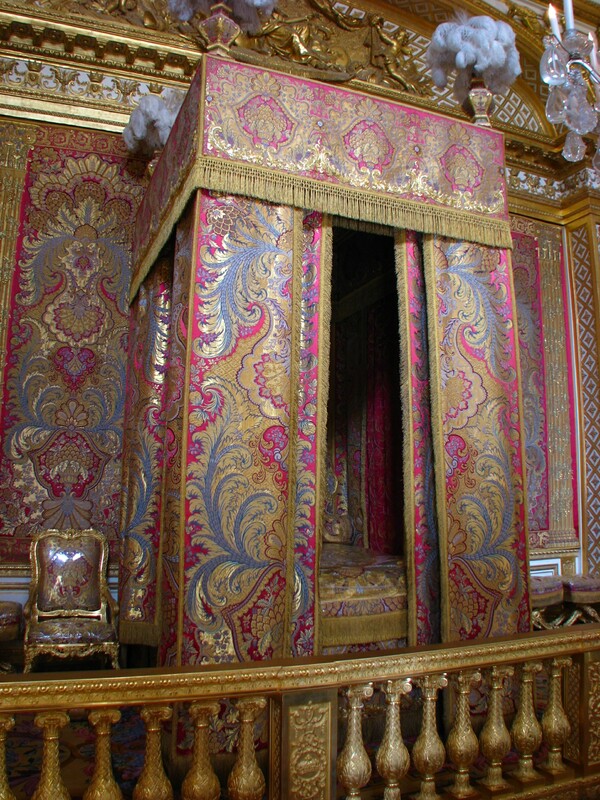 It’s difficult to believe today when gazing at the gleaming golden palace, but life at Versailles was actually quite dirty. There were no bathrooms as we would know them. Courtiers and royalty used decorative commodes in each room, while commoners simply relieved themselves in the hallways or stairwells. No one bothered to house-train the royal dogs, and servants did not consider cleaning up after them to be part of their job description. The constantly-altered chimneys did not draw well, so everything inside was covered with soot. The filth and disorder at Versailles during the ancient regime were noted in many records of the time. 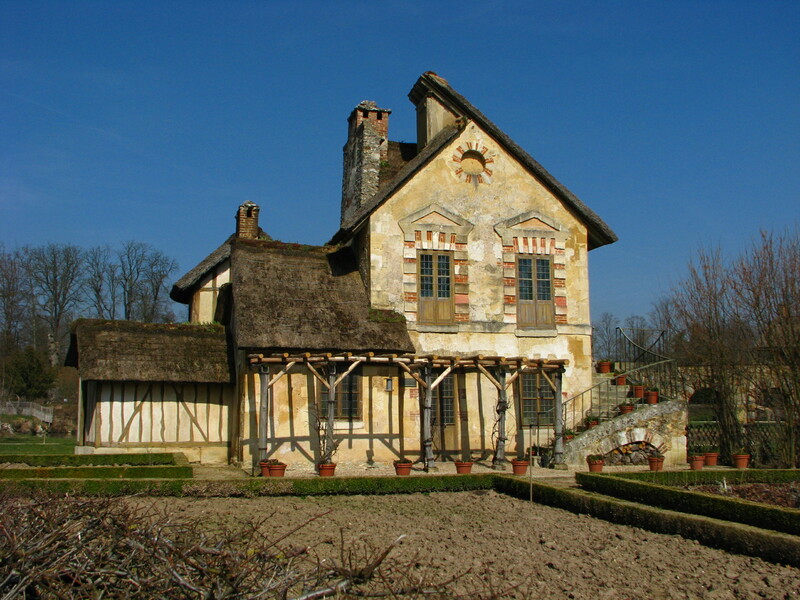 The charming Domaine de Marie-Antoinette was built to look like a rustic farmstead. In order to escape the commotion (and dirt) of palace life, Marie-Antoinette built herself a calm and private little hamlet of quaint rustic buildings about a mile from the palace, where she could wear casual clothing and relax with her friends. She had read the writings of the philosopher Rousseau and longed for the simple country life that he extolled. At her little hamlet she kept sheep and chickens and milked cows with her children. The grounds are much shrunken from bygone days but still extend for several miles. 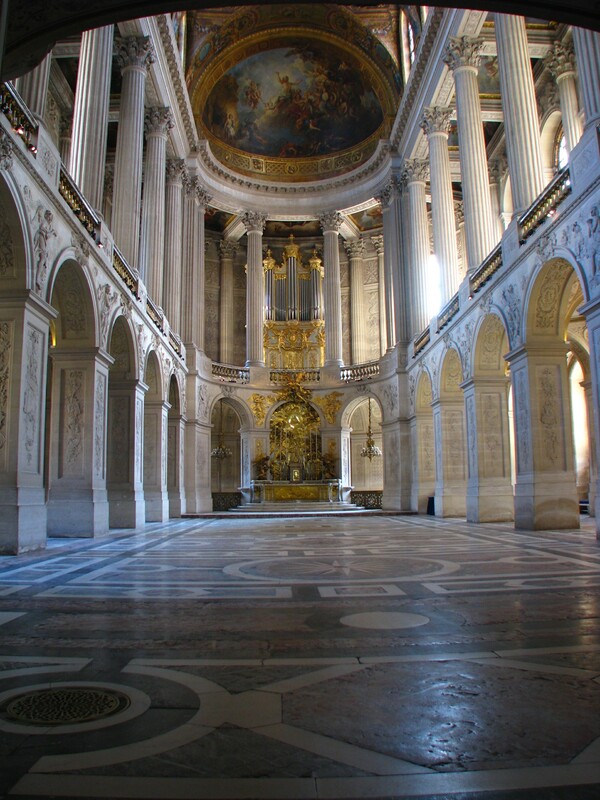 Today the state rooms at the palace of Versailles are carefully maintained for the visitors who stream through with audioguides and cameras. Only the most impressive rooms are displayed, because the place is so vast that it would take days to tour it all. The grounds, shrunken to a fraction of their original size, are nevertheless still several miles long. 200,000 trees grow between long diagonal avenues. Rental rowboats ply the Grand Canal, and a nearby café offers tables beneath the trees. The Domaine de Marie-Antoinette is well worth the long trek across the grounds; heirloom breeds of farm animals are kept there and the queen’s rustic cottages are charming. 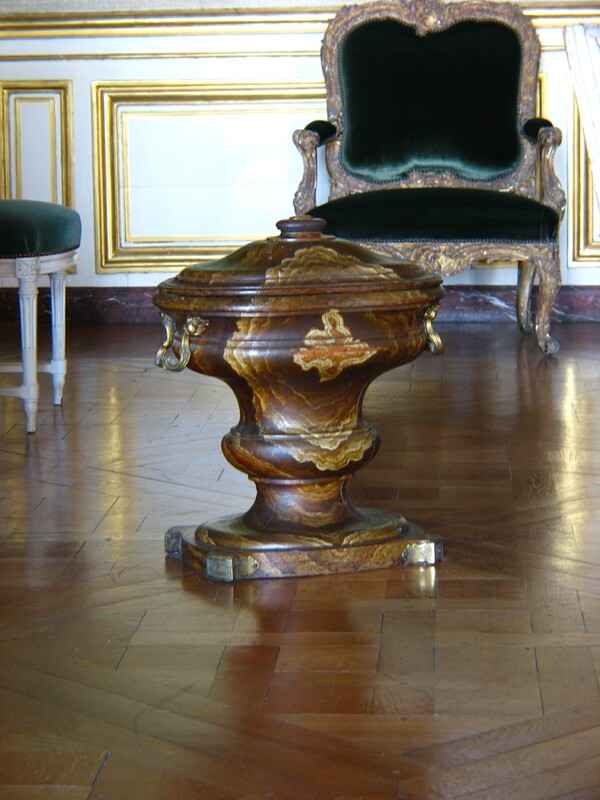 This wooden chamberpot was faux-painted to resemble marble. Servants could not have lifted a stone chamberpot in order to empty it. Life at Versailles was not just foie-gras served on golden plates. In need of cleaning, requiring expensive maintenance, and with in-laws living in the wings, Versailles was not so very different from many homes today. thank you so much for putting thisup. i didn’t realize about the house being so dirty. it makes sense. no wonder marie a. wanted to live elsewhere. more control over things. more privacy. more friendly. i understand her better. I can’t even imagine how awful it must have been for her to give birth in a room so crowded with courtiers and onlookers, so hot and airless that the windows had to be broken open to revive her. Living at Versailles was like being a bird in a cage, always on display but enjoying virtually no freedom. « We are all zombies!